In an effort to be more strategic in our prevention work, the KNOW MORE graphic was created in Spring 2018. 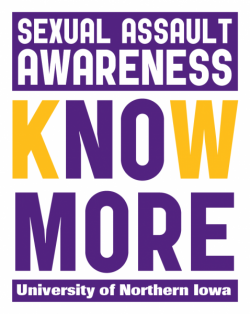 This graphic is meant to be used as a deliberate communication tool included with sexual assault awareness and prevention efforts on our UNI campus. This graphic provides the opportunity to reach students with consistent messaging about promoting a safer community and furthering the understanding of gender-based violence prevention. If your organization is interested in including this graphic with one of your sexual assault awareness and prevention efforts, please contact the OCEM at equity@uni.edu.